Bahia Principe Tulum Links: Gran Bahia Principe Tulum main site. 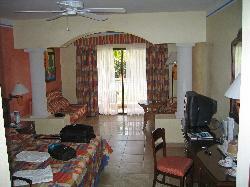 View inside of room at Bahia Principe Coba in Mayan Riveria in Mexico. This is the view of the bed, sitting area and patio door. The free shampoo, soap, gel supplied by Bahia Principe at their Coba location in the Mayan Riviera. 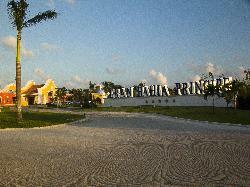 The main entrance sign for the Bahia Principe resort in the Mayan Riviera. 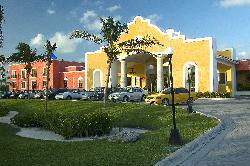 This resort complex is three resorts, including Coba, Tulum and Akumal. 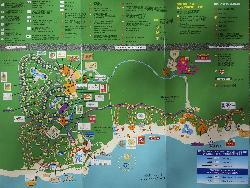 Site map of Bahia Principe Coba, Bahia Principe Akumal and Bahia Principe Tulum. Taken from the flyer supplied to the visitors. Located along the Mayan Riviera in Mexico. A view of from the dock. The beach and the resort of Bahia Principe Tulum in the Mayan Riviera of Mexico. 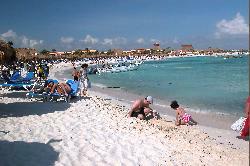 The is the shared beach for three resorts. Coba, Tulum and Akumal. Beach Map taken from flyer at Bahia Principe in Mexico. Shared by Bahia Principe Coba, Akumal and Tulum. 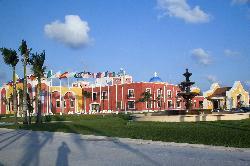 The Hacienda Doña Isabel at the entrance to the Bahia Principe Resort in the Mayan Riviera of Mexico. This building serves three resorts, Coba, Tulum and Akumal. Looking northwest along the beach at the Bahia Principe in Mayan Riveira. 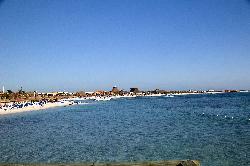 The is the shared beach for three resorts. Coba, Tulum and Akumal. Beacher is shared with Akumal and Coba.